In just two months, a federal law kicks in requiring hospitals to tell their Medicare patients if they have not been formally admitted and why. But some physician, hospital and consumer representatives say a notice drafted by Medicare for hospitals to use may not do the job. The law was a response to complaints from Medicare patients who were surprised to learn that although they had spent a few days in the hospital, they were there for observation and were not admitted. 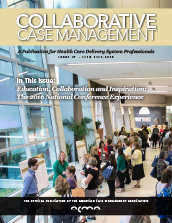 The latest issue of Collaborative Case Management is now available online in the CE center of the ACMA Members Only section and set to arrive in your mailbox soon. Visit acmaweb.org/login to access the current issue and earn CEs. Did you know that 66 percent of case management departments report that case management certification is influential in hiring decisions? Additionally, more than half (52 percent) of case management departments prefer the Accredited Case Manager certification over all other case management credentials — more than twice that of the next most preferred certification. Stand out from the crowd by applying for your ACM™ today. Rosalyn McFarland provides primary care to some of the most challenging patients in the health care system: people with severe and chronic behavioral health conditions. But McFarland, a nurse practitioner at Whole Health Clinical Group in West Allis, has the advantage of working closely with its psychiatrists, psychologists and other therapists, pharmacists and case managers. Many 30-day readmissions may not be linked to poor care, but instead to mental health issues, homelessness or substance abuse, according to a new study published in JAMA Surgery. The research team analyzed data for 2,100 patient discharges at one Level 1 trauma center and safety-net hospital and found 173 of those patients were readmitted. A House committee Wednesday voted unanimously in favor of advancing a sweeping mental health reform bill. The Helping Families in Mental Health Crisis Act passed 53-0 in the House Energy and Commerce Committee and is now going to the full House floor. Frequent visitors to Kaiser Sunnyside Medical Center's Emergency Department might notice a subtle change. In order to take its work in reducing ED re-admissions, Kaiser Permanente Northwest has begun stationing "navigators" within the department to connect directly with patients who use a lot of emergency care.